Exploded drawings are extremely useful when explaining a design / idea. The drawing opposite is a design for an educational toy (for a young child) has been drawn with all the parts disassembled. It is important when drawing an exploded view that all the parts line up with each other when disassembled. The vertical guidelines clearly show how the various parts are in line with each other. If an exploded drawing is constructed properly anyone looking at the drawing should be able to see how the various parts go together to form the finished design/object. Exploded views are useful because detail can be seen, parts are not hidden behind other parts. DIY furniture often arrives with instructions in the form of exploded views. Without this style of drawing it would be very difficult to explain how the parts go together forming the final piece of furniture. The example below is taken from a set of exploded views showing how to build a small piece of furniture. What do you think is wrong with the way both drawings are presented ? The answer is that the quality of presentation makes it difficult to see how the product is to be fixed together. When you draw an exploded view you must ensure that the drawing is clear and accurately represents the object / design. Another example of an exploded drawing is seen below. It shows a popular exercise machine and how the various parts fit together. Study the drawing carefully and answer the questions below. 1. 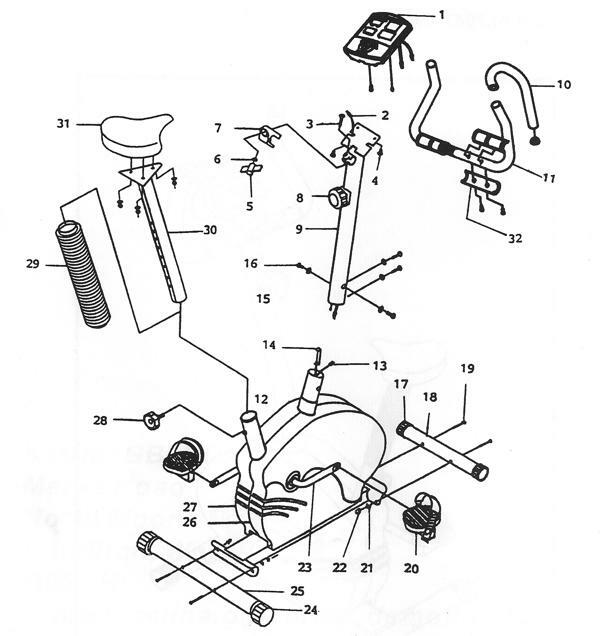 Would you find it easy to follow the drawing / pictorial instructions for putting together the exercise bicycle shown above? Explain your answer. 2. How could the drawing be improved so that it is more likely that the parts of the exercise bicycle could be fixed together successfully?